Ginseng contains properties that are believed to be responsible for helping the body to build energy, resist stress, and improve its general wellbeing. Many compounds have been isolated, the most important of which are ginsenosides, it is also thought that ginseng contains a number of nutrients which play an important role in the body's use of vitamins and minerals. Each capsule provides 100% pure; Lyophilized Royal Jelly equivalent to 300mg of hydrated Royal Jelly and 300mg Panax Ginseng. 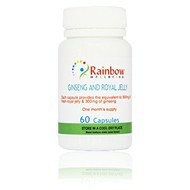 100% pure; Lyophilized Royal Jelly equivalent to 300mg of hydrated Royal Jelly and 300mg Panax Ginseng. No bulking agents or additives of any kind.